With a female Thor coming in October, Marvel has decided to change the inscription on Mjolnir to read "she" instead of "he." With those lofty words Marvel formed the foundation of one of its most endearing heroes: the mighty Thor. That being the case, change is on the horizon. Marvel will be releasing a new comic series this October wherein the titular God of Thunder will be supplanted by a new Asgardian goddess who will take on his mantle and powers. Thiss in mind, the publisher has revealed that it will be altering the inscription on the hammer Mjolnir to be more appropriate to the new Thor's gender. 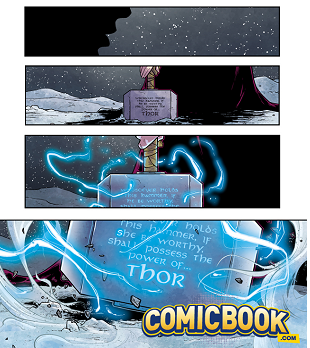 In the new comic, the inscription (viewable in art published at ComicBook.com) on the famous weapon will now read, "Whosoever holds this hammer, if she be worthy, shall possess the power of Thor." Now granted, as far as alterations go, this isn't the most Earth-shaking thing we've seen to come out Marvel. That being the case, it's still the sort of fodder that we could see some purists using to fuel the fires of their discontent. What do you think about the new inscription? Is this one altered word a big deal? A necessary change? A step over the line? We're eager to hear your impressions on this and your thoughts on the new Thor in general.